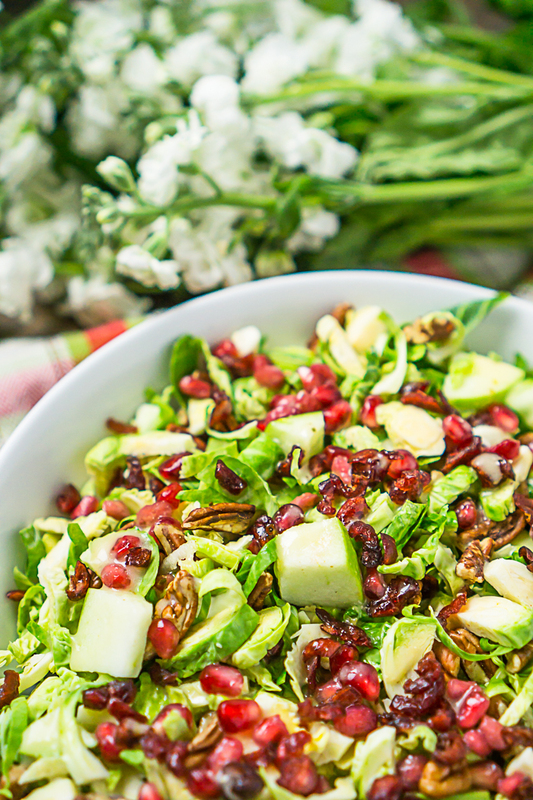 With only 15 minutes of prep time, this crunchy Cranberry Apple Brussels Sprouts Salad recipe is a satisfying salad for your holiday table! Cranberries, apples, and pecans combine for a perfect seasonal holiday side dish. Back to the point. When my husband finally decided to give Brussels sprouts a try and actually really loved them pan roasted, I decided it was time to start experimenting with a few different Brussels sprouts recipe to add into our rotation, including a few tasty Brussels sprouts salads. Bryan was really skeptical of this dish at first. He’s not a huge salad eater anyway, so the idea of making a salad with Brussels sprouts weirded him out a bit. He was pleasantly surprised though! 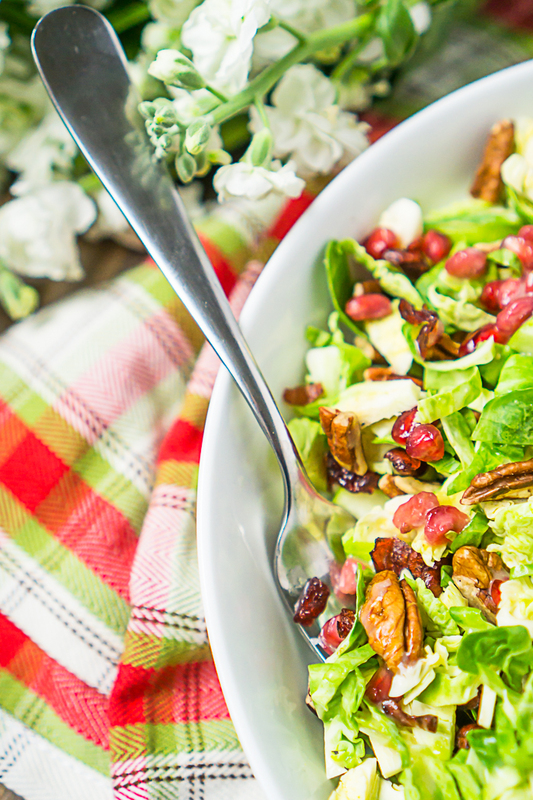 Brussels sprouts salads have a wonderful crunch to them, made even crunchier with tart green apples and pecans. 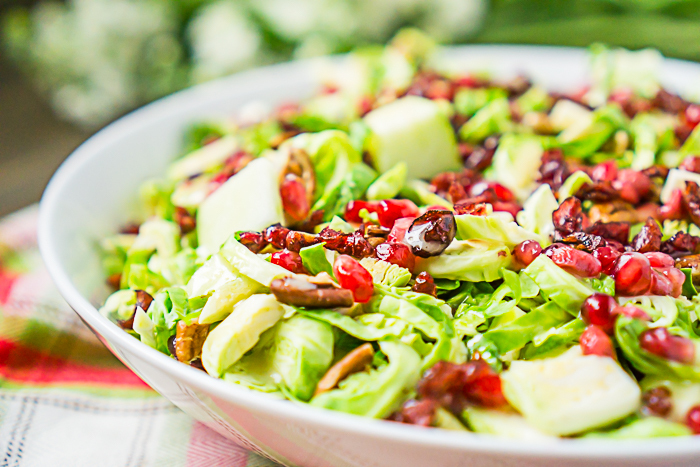 Add in sweet dried cranberries and pomegranate seeds and you have a gorgeous seasonal salad that would make a great holiday salad. For regular family dinners, we just use our favorite Italian salad dressing. When making this Cranberry Apple Brussels Sprout Salad for Thanksgiving or Christmas, I want to give this recipe for Creamy Apple Cider Vinaigrette a try or this Creamy Maple Balsamic Vinaigrette. Maple dressing with a little crumbled bacon actually sounds perfect to me right about now! Several grocery stores sell shredded Brussels sprouts that you can purchase in a bag, but I prefer to shred them myself at home for Brussels sprouts salad. First, because I find that they’re fresher and taste better. Second, I find that putting in the little bit of prep work myself makes them more economical as well. I have found that I can shred and wash them and keep them in a ziploc bag in the fridge for up to a week, so you can definitely do the prep work ahead of time for the holidays. Just make sure you dry them well after rinsing. Here is the simple process for shredding them without any need to remove the core, which speeds up the process a TON! Cut the Brussels sprout in half. Lay flat and thinly slice from top to core to create shreds. You can also cut them in half and run the Brussels sprouts through your food processor OR cut them with a mandolin slicer. Lots of easy options for your preference. TIP: If you don’t like core in your Brussels sprout salad which can be extra crunchy, I recommend getting this core removal tool! It easily removes the core from the Brussels sprouts. Just use it as step 1! Good Chef Knifes – A sharp chef knife will make shredding your Brussels sprouts easy work! Mandoline Slicer or Food Processor – In case you don’t want to cut them by knife, but of these will make quick, easy work of your Brussels sprouts. Core Removal Tool – If you don’t like the crunchier core pieces in your salad, this tool will save you a lot of time and effort. Crunchy and Delicious Brussels Sprouts Salad! 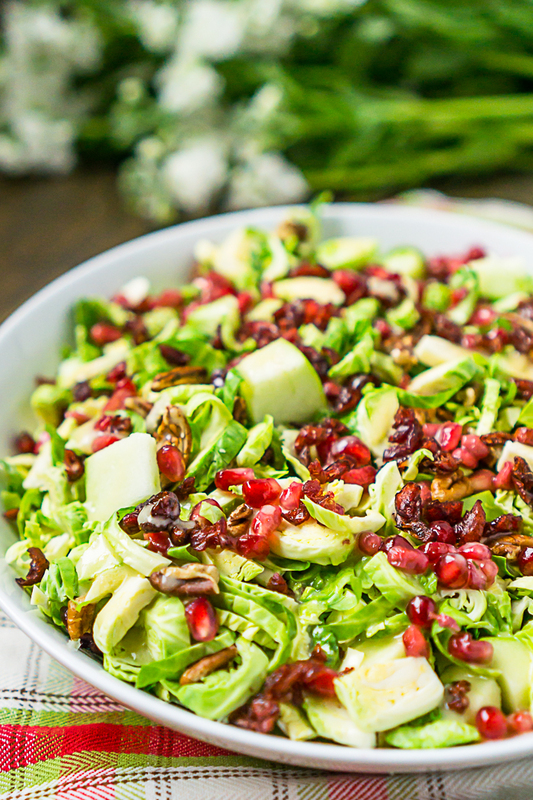 With only 15 minutes of prep time, this crunchy Cranberry Apple Brussels Sprouts Salad is a satisfying seasonal salad for your holiday table! Place chopped brussels sprouts, cranberries, apples, pomegranate arils, and pecans into bowl and mix. Toss with salad dressing of your choice. We used our favorite Italian salad dressing.